With richness; the racing lambs too have fair their fling . . .
Robins are sweeping my back yard and singing their hearts out. Lambs and calves are taking their first quivering steps. Mostly, hope is in the air as well as a sweet smell of redemption. Today–rain. While we don’t want floods, maybe the moisture will melt the remaining snow banks and urge early flowers to burst forth. With Easter bouncing upon us this Sunday, I am putting away winter coats and pulling out spring/summer clothes, which in my closet equals capris and short-sleeved T’s. I am also eager for the last weekend in April-27th, 28th. 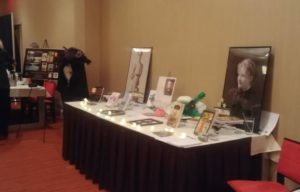 I will be selling my books at the Midwest Homemade Artisan Fair at the River’s Edge Convention Center. 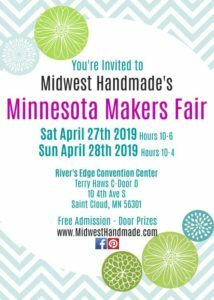 “We will have over 75 artisans from 5 Midwest States at this handmade only event held in room Terry Haws C at the River’s Edge Convention Center in downtown St Cloud, MN. Saturday Leighton Broadcasting will have KCLD on site from 10-12, and WILD Country from 1-3. In addition to taking place near my favorite locality, the Mississippi River, and one which I write lots about in my books, including my Minnesota Main Street Women series, this event promises to be fun and a great way for the wonderful artists to show off their stuff. Happy spring, and hope to see you soon..
I’ll not be presenting this weekend, but hope to see some of you soon. Unfortunately, this event has been postponed. We will be rescheduling soon. Spring is here, unfortunately causing lots of water and damage. I sit on sandy soil so house and hubby are high and dry. Other people and places–less so. And I am taking a trip to southern Minnesota–where lots of snow and rain have made life uncomfortable for so many. Hopefully, this melt will slow down soon, floods will recede, and white, yellow, and lavender-blue wood-sorrel will sprout on the Midwest prairies. As I said, I am heading south over the weekend of April 6-7. Many of you remember that I earned a grant from the United Methodist Church’s General Commission on Archives and History to research and write about the life of one of my minister’s, Reverend Mary MacNicholl. She served almost entirely in Minnesota from 1950-1971. I’ve learned so much about this woman. As a child living in Merchantville, New Jersey, Mary MacNicholl felt an early call to become a minister, and told her kindergarten teacher her plans. We have no idea what her teacher might have thought or said to her; it was the early 1920’s, women just received the vote, and many became hopeful for their futures. Yet, if the woman tried to discourage her, Mary stood fast to her goals and let nothing dissuade her. Truth be told, Miss Mac seldom swerved on her path, even if she had to side-track around a few boulders to get where she needed to go. 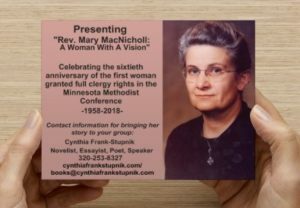 I am bringing the story of Reverend Mary MacNicholl’s story back to one of the churches, the Wykoff United Methodist, where she first preached in Minnesota in the 1950’s and where she became the first ordained woman minister of the Methodist faith in 1958 in Minnesota The woman minister’s courage, strength, endurance, perseverance, and quality of character impressed many. Just as important, Reverend Mary MacNicholl, Miss Mac, Miss Mary, Mary Mac–paved a path for so many to follow. If you are in the area, come and learn about this inspirational woman. Wykoff United Methodist Church, Wykoff, Minnesota. I’ll be posting again soon. I have a big event in St. Cloud at the Convention Center the last weekend in April. More to come. I had a wonderful time last night presenting strong Main Street Women to the group of men and women at the Marriott. I was well-received, thanked profusely, honored, and congratulated for my presentation. Again, thank you, League of Women Voters. Thank you, Pat Fillmore, for bringing me to your group of people who are still persisting in the fight for equality. I want to thank my sister, Becky Frank, for helping me. She hauled, decorated the table, took pictures, took money and much more–supporting me in this endeavor. Becky’s display of my all my books. I am being introduced to the crowd. Here I am presenting Women Awakening. I sold lots of books as well. So it was a good night all around. The weather even cooperated. It sounds like we have more on the way this week and into the end of Feb.
Hope to see some of you again soon. I was saddened to hear Necco was no longer making their candy hearts. 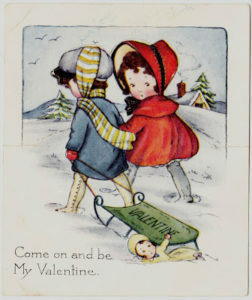 These little sweet messages were the main staple of my childhood Valentine’s Day. I strategically placed “First kiss,” “Be mine,” or “Forever,” in the envelopes that I filled out for my friends, special likes, or sweetheart. Of course, I never signed my name to any of the cards that were for that special someone. He had to guess who gave him the sweet tidings. If he were a 3rd-6th grader, he probably tried to escape the thought that I found him special. I know we made special cards in class for our parents, but we bought the wonderful boxes of individual cards to give to our classmates. Sometimes we decorated our Valentine’s box in school. Sometimes we had to decorate them at home. Usually, created out of a shoe box, I made use of white paper doilies, red construction paper, and other bits of flowers or ribbons I could scrounge from my mother’s stash. On Valentine’s Day, we placed our boxes on the top of our desks. Before school started, we walked the aisles, slipping cards in each other’s boxes through the slit on top. We had to give everyone a card whether we liked him/her or not. I learned to play the game at an early age. I saved the cards I didn’t like to give the kid I didn’t like and the same went with the candies–the most nebulous sayings went to those I didn’t like so much. The sweetest sayings and cards went to the one or two boys I really liked –always anonymously. Of course, I signed my best girlfriends’ cards, giving them special messages of undying loyalty and friendship– and always the candies with the sugary and cutest words went to them as well. I don’t think the boys really got into the whole Val. Day thing, but we girls loved this tradition from an early age. I wonder if any of this game playing has changed with kids now. Although Necco is no longer sending these discreet and sweet verses, we can always count on Brach’s for “Tiny Conversations” to send to our loved ones. Of course, my needs are a bit more complicated as I’ve gotten older. I am wondering if my husband will find one on his supper plate that reads, “Please, do the dishes,” especially since I made him a romantic meatloaf and baked potato supper. P.S. Don’t forget, I am still offering good sales on all my books. Before sending me a check or looking at my paypal set up, check with me. I can make you a deal, and it won’t be anonymous! 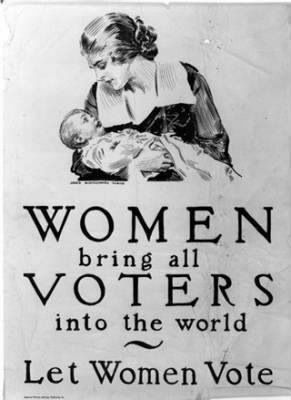 Ninety-nine years ago in 1920, during its annual National American Women Suffrage convention, six months before the 19th Amendment was passed, President Carrie Chapman Catt founded the League of Women Voters. Born out of a desire to arm women with the knowledge and skills to vote intelligently, the League is proud of the fact that it is non-partisan. Non-partisan it may be, but it always stands for democracy and encourages its members to work for rights and “reforms” for all citizens. 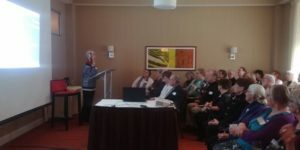 Last fall, I was asked to speak at the birthday party, February 16, 2019, for this unique group in St. Cloud. Coincidently, I had just researched another of the National American Women Suffrage presidents, Anna Howard Shaw, for a paper I received a grant for to research and write about the Minnesota’s first fully-ordained woman Methodist minister. Mary MacNicholl worked her way through college at Pennsylvania’s Temple University to earn an educational degree and then turned missionary for a number of years before her father died in 1942. Why did she wait until her dad died to attend seminary since she had prepared herself since youth to become a minister–no drinking, no dating, no dancing? One reason could have been because he disapproved of women ministers; another was because of money. Attending Drew University, in New Jersey, was going to be expensive. With all her experience teaching and money she had saved, she was able to attend divinity school. She was a serious student who was willing to live in a dorm at the age of 30+ to work toward her goal. So was Anna Howard Shaw. Born in 1847, she came from England when she was four years old to live in Michigan in a log cabin, far away from neighbors, stores, and a post office. She, too, felt an early call to preach. She graduated from Albion College, and then, after years of financial struggle, earned her divinity degree from Boston University. Yet, the Methodist Episcopal Church refused her ordination because she was a woman. She appealed to the Methodist Protestant Church, and became the first woman to be an ordained Methodist minister–anywhere. She wasn’t finished with her education, learning, or being concerned with the welfare of others. While preaching at the Methodist Church in Dennis, Massachusetts, on Cape Cod, she went on to earn her medical degree from Boston University as well. Now as a doctor, she went to the back streets of New York to learn about and help suffering families. She had been an avid supporter of temperance in Massachusetts, teaching and lecturing about the sacrifices women and children had to make because of booze. After seeing women and children suffer at the hands of brutal drunkenness, Shaw became an active member of Women’s Christian Temperance Union, WCTU. In 1886, Shaw became friends with Susan B. Anthony. Shortly afterward, she became involved in the National Woman’s Suffrage Association. She became an advocate for merging the National and the American suffrage groups to gain power. In addition, at one point, Anthony saw how torn and tired Shaw was serving both temperance and suffrage. Anthony suggested that for the time being, Shaw should work on one project at a time. The minister/doctor weighed her choices. She saw that if women had the vote, maybe that would empower them enough to fight for their families’ welfare. Anna Shaw left WCTU as active campaigner to become totally dedicated to suffrage. Two years before she died in 1906, Anthony stepped down, and Anna Howard Shaw became president of the National American Woman’s Suffrage Association. Maude Porter, in my recently released, Pins & Needles, fights for women’s rights as well. The setting is 1909-1910 in the river village of Clearwater, Minnesota. She sees first-hand problems tumbling out of Pat Quinn’s Saloon right across from her millinery shop. She is an active member of both the Minnesota branch of the National American Woman’s Suffrage Association and WCTU, which has put her in the spotlight, causing trouble for her with drunks who do not want any more temperance or suffrage meetings in town. Although Maude initially believes education is the key to waking up the world about the influence of drink, she soon realizes prohibition is the answer. Like Anna Howard Shaw, Maude discovers she can only fight one problem at a time. For now, she advocates for Quinn’s Saloon to be shut down. Last fall, on election day, I overheard a woman say she didn’t vote. I was shocked! I wanted to shout at her that she threw her vote and I wouldn’t want to hear an argument about the outcomes. (You’ll be happy to know I didn’t raise my voice or criticize her.) I thought, oh, well, I guess this is why I write what I write –to help others understand about historical women and women’s issues. I was never an immigrant learning a new language and new ways in a foreign land. I haven’t had to fight my way to get an elementary education. But I’ve had to have my dad co-sign his name to my bank loan for a car when I made more money than he did. I’ve had to fight to have only my name listed on another car loan when the Ford dealer assumed my husband was the only one to drive. I also was told that my first teaching position didn’t usually pay women the same wage contract as a man. Like Maude Porter believed, way -way back, we women still have work to do in order to have our voices heard and counted. I’ll be speaking at the League of Women Voters—St. Cloud February 16th at the Marriott downtown St. Cloud. This is the annual membership conference, and all are invited. Think about joining. The two websites explain their purpose. The meeting starts at 4; at 4:30 I’ll be talking about Minnesota Main Street Women–the theme of my novels–Scruples & Drams and Pins & Needles. These women knew they were nearly powerless. In Scruples, we learn Jennie Phillips, the protagonist, has passed all her state tests to earn her pharmaceutical license, but Minnesota won’t issue her this certificate because–she is a woman. Both Maude and Jennie know what they and others need–legal rights, access to medical knowledge, avenues for education to better themselves, and the vote. One fight at a time, one foot in front of another. . .that is what women have done since time eternal. No one should forget what has been done for you already, nor take it for granted. Democracy is our vote for a voice in this nation. And for those who don’t always take the time to put X’s by people’s names they hardly know, they are not sure about how to vote their opinion, or they don’t think their vote counts, they can contact a League member and ask them where to find information about the candidates and the issues. Without this opportunity to express opinions, all people are powerless. Women have been silenced many times before, and even recently, like Elizabeth Warren, while she was reading a speech by Coretta Scott King, a Republican leader basically told her “to shut-up.” The response was “outrage,” and the term “Nevertheless, she persisted,” popped up on coffee cups, t-shirts, and magazine covers. Women had a new fight with new ammunition. Women’s voices do count; we won’t be silenced. I thought you’d enjoy this poem about Christmas magic. A few years before the Beatles entered the scene, I was in a state of doubt. I was, seemingly, too old for baby dolls yet too young to think I needed a daily bath. I had heard rumors that Christmas wasn’t all it was bragged to be. The story actually took place and the characters are true. For nearly seven years, our family lived in Lynden Township, Minnesota, by Warner Lake and Plum Creek. I took this little ditty from my memoir, Postcards from the Old Man. Winters at the Warner Lake held their own charm. Except for the path the landlord’s tractor made for us from the road to our house, snow mounds covered the yard. Probably because I was older, Christmases took on a different dimension here as well. Navy blue, crystally winter’s night. as Becky pulled me down the glossy road. star-shaped cookies, his tummy and our chimney. Late autumn’s whispered secret unmasked the man. although I no longer believed. dashing across the blue-black sky. Becky and I tumbled through pockets of snow. The yard glowed—lit house and trees. Who was that all hunched over in the shadows? pulled off our coats and pushed us into the living room. Becky ran to a diapered doll and teddy bear. Betty Crocker bake set, white fur-topped boots. and a plate of cookie crumbs. I ran to the window. Cupped my hands around my eyes. I decided to believe for one more year. Most Christmases hold me under their spell. I can get done what I have to get done. And, I love the sparkle of lights, the glitz of foil wrapping paper, and the cheery and moody music blasting from the radio. But, I don’t always like the reality I am dealt. I may have retired a few years ago, but for the last four years, I’ve been writing and editing books. Before that, I corrected essays up to the moments before semester grades had to be handed in to administration. I was always in a rush to finish baking, shopping, wrapping presents, and sending quick notes to friends. This year, the world’s chaos can steal anyone’s joy. Yet, I hope for you and me a nice Christmas, however we find it. Turn off the TV. Sing a few songs, make a toast with our favorite friend or loved one for a peaceful, less stressful new year. Like I did as a child, I am deciding to believe in the old man’s magic, at least for one more year. Most importantly, for me, personally, I cherish the gift of the babe-in-cradle burrowed in that meager way-station so long ago. It’s the simple truths that matter. Kimball, MN, Holiday Stop ‘N Shop–alert: cancelled for just me. Hello, again–just an update due to some back, neck, and shoulder health–I am cancelling my part of the Kimball event. I hate to do this, but it is necessary. Please contact me for a good deal on some books, though. I can reconfigure the paypal system just for you. Hopefully, the turkey is all eaten, or in its last regeneration– soup, tetrazzini, or chili. Come on out and see what you can find for holiday gifts–a great selection of items–at the Kimball, MN, Stop ‘N Shop, at the Kimball United Methodist Church. Don’t forget–books make great presents, and I am bringing all mine for selling and signing. Pins & Needles is the sequel to Scruples & Drams. Both are suspense novels, set in Clearwater, MN, the Mississippi River town in the central part of the state. These women I write about believe that helping those less fortunate and able is part of what they’ve been called to do in their lives. They may not always agree ideologically with each other, but help is their mantra. Minnesota Main Street series may be set in Clearwater, but its subject is universal. Women have been facing common issues since the beginning of time–lack of education, lack of money, lack of equal pay for equal job, lack of proper health care, and the list goes on. Maude Porter, the protagonist in Pins & Needles, see these problems are worsened for the families suffering from the male head of the family imbibing at the booze hall across from her Millinery Shop. She has endured as much as she can after she is harassed and a friend is beaten to the point of death. She votes for temperance and will not rest until saloon has been shut down! 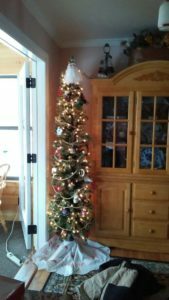 While you’re shopping for presents, pick up Around Clearwater as well to for a historic background on this village that has great ties to the Twin Cities, the east coast, Canada, and Europe. I have a couple of Postcards from the Old Man left as well–my memoir of my early years growing up in Clearwater. The Old Man, as mentioned in the title, occasionally causes snickers because some believe I am writing about my father or husband. When they laugh at the title, I almost start crooning the famous Show Boat tune, “Ol’ Man River” (go ahead, click, and listen to this marvelous song by Paul Robeson. While he signs that he wants to run away from this body of water because it means enslavement, I feel tied to it, inspired by it, strengthened by it, and I feel it flowing in my veins. 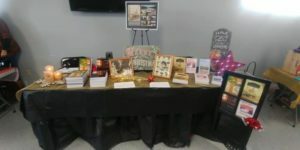 So remember that books make great gifts, wrap yourselves up in the spirit of the season, and come on over to the vendor, craft, art sale in Kimball, MN, at 141 State Highway 55 P.O. Box 414 Kimball, MN 55353. I heard they have a Christmas lunch and bake sale going on as well. Have a joyful and blessed holiday season. 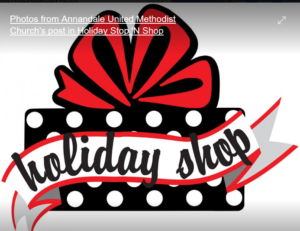 Come on out to the 15th Annual Holiday Stop & Shop in Annandale, Minnesota, at the United Methodist Church, from 9-2. In case you’ve never been to this town, here is the webpage https://www.annandale.mn.us/. You’ll notice me! I’ll be sitting with all my books at a round table, unlike the oblong one below but with the same books and decorations, with black tablecloth. My sister Becky will be there too. At 9 a.m. I’ll still be drinking cofRfee, and I may have forgotten to have combed my hair, but I’ll love to see you. Remember books make great holiday gifts! Just a reminder: I’ll be selling and signing my books at the 3rd Annual Clearwater Vendor and Craft Event tomorrow Nov. 10 from 10-3 in Clearwater at the Lions’ Bldg on Highway 75. December 1, I’ll be selling and signing books at the Kimball United Methodist Church event from 9-2.